Publicity Stills of "Dance of the Dragon"
Korean country boy Tae has dreamed of being a famous ballroom dancer since his first encounter with the beautiful art form when he was a young boy. 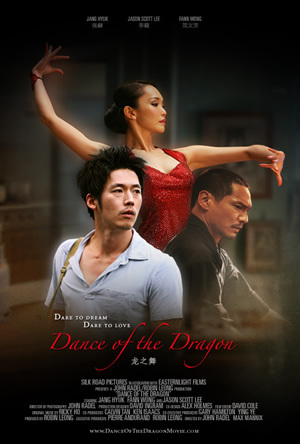 Twenty years later, self taught with the aid of dance videos, Tae knows the only way to take the next step is to leave Korea for Singapore where he can be trained by Emi Lim, a former ballroom dancing champion forced into early retirement due to an injury and now renowned for her ability to take dancers to great heights. As the only student in the class without a partner, Tae sometimes partners Emi in training. Before long it becomes apparent that he has developed feelings for her. Too professional to be involved with a student, Emi continues with her efforts to train her dancers for the upcoming national ballroom dancing championship. Tae struggles with life in his new environment so far away from home, from finding a place to live, to locking down a job to survive. He is beset with obstacles, but none loom larger than Cheng – Emi’s boyfriend and former martial arts champion. Cheng’s concern for Emi has him take a watchful and protective approach over matters concerning her. Threatened by the new student, Cheng warns Tae to stay away from ‘his girl’. It is a warning that soon turns to threats. It takes Korean hunk like Jang Hyuk to carry this off: A boy who dreams of being an accomplished ballroom dancer. In the hands of any other mere mortal, this role would have been fleshed out stereotypically as a flamboyant wannabe. But here in his first English speaking role, the heartthrob paves his way to becoming a star international directors should look out for. Known for his breezier roles in Windstruck (2004) and Volcano High (2001), Jang plays a country boy who arrives in Singapore to enroll himself in a dance school. Before he knows it, he finds himself developing feelings for his beautiful mentor, while being threatened by her boyfriend, who was a former martial arts champion. The 111-minute movie culminates with an international ballroom dancing competition which is everything our protagonist has dreamed of since young. And in this finale you’ll see our very own Fann Wong dancing with Jang, donning a diamond studded dress specially designed by one of Singapore’s top designers, Francis Cheong. The crystals on the dress, in different shades of red no less, aren’t the only things you’ll take note of. You’ll also notice how ravishing the actress looks throughout the movie with her sponsored jewelry, so much so that you are distracted by her awkwardly scripted lines. 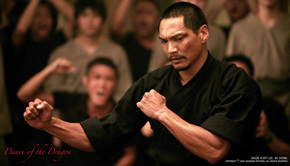 Jason Scott Lee (Dragon: The Bruce Lee Story, Balls of Fury) plays her jealous boyfriend who spouts one-dimensional angry dialogue at Jang. Familiar local actors like Lim Kay Tong, Jason Chan and Gerald Chew fill up the somewhat forgettable supporting roles. Co-directed by John Radel and Max Mannix, the film features beautiful cinematography courtesty of Radel, who doubles up as the director of photography. Check out the adequately done street scenes of Singapore, thanks to support from our tourism board. There are also images which provoke exoticism of the Asian world. The tracking and slow motion shots also effectively portray the tale of passion, dreams, love and hope. However, the sometimes overbearing emotionally dramatic score and the sometimes overlong intense gazes of the characters may be a test of patience to the edgy viewer. Seeing that this is a drama about daring to dream, expect lines which you can only hear in a movie. Serious expressions, solemn exchanges, heated arguments and passionate looks of love are aplenty here, with a lack of lighter moments. What works is the story between Jang and his parents back in Korea, which manages to pull heartstrings. The movie also gets points for its wonderfully executed dance choreography. Whether it’s the waltz, the samba or the classical ballroom dance, seeing Jang and Fann moving gracefully across the dance floor will make you think that anything is possible with you are determined and daring enough to dream. In one scene, Jang’s father tells him: “Hobbies are dangerous things because they turn into dreams” Being a mere mortal, we wouldn’t dare to harbor such thoughts, especially anything to do with ballroom dancing, because we know the glitz, glamour and grace we see on screen remains on screen.